X Over 0 crafts objects that test the limits of current technology. Our designs are at the forefront of a new aesthetic that wouldn't otherwise be possible. Our guiding principle is: if it can be made by traditional production methods, we don't design it for 3d printing. This shop displays a currated selection of our line. Our full collection can be found at XOVER0.STORE. X Over 0 is the studio of designers Katherine Voorhies and Duane McLemore. As designers on the digital frontier we will act as a revolutionary vanguard, seeking out and using the most advanced tools, techniques, and production means that we can seize for ourselves. We will use these technologies appropriately and to their fullest potential. We will probe the horizon for what’s just beyond. We promise constant experimentation. Our jewelry forms are delicate and intricate, but they also have an ordering logic that will keep you contemplating their beguiling complexities. We released our first products in September of 2016. 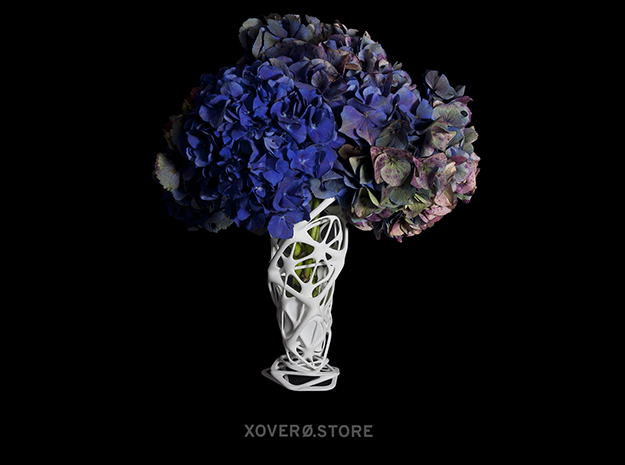 Our full collection can be found at XOVER0.STORE.